Orphaned at a young age, Skylar McHenry grew up as little more than a servant and shunned by everyone around her because of her reputation as a pirate's daughter. Each day Skye faces is marked by some new struggle. Her only hope is to rely on her heavenly Father's care and comfort and the solace of her best friend, Will, who has become more than dear to her. Just when an unexpected encounter gives Skye a small glimmer of hope that things might change in her favor, her world is shattered. She is awakened in the night by cannon blasts. Pirates storm the orphanage, drag her away, and force her aboard their ship. The cruel captain's intentions are clear. He will extract from her, through any means necessary, the location of the treasure hidden by her father. For Skye to divulge the location would mean breaking the last promise she made to him. She's certain she never will, but what happens when the lives of those dearest to her are at stake? 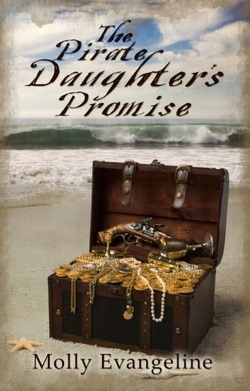 The Pirate Daughter's Promise is full of daring high seas adventure; sweet, wholesome romance; surprising discoveries; unlikely new friends; and the rewards of trusting in God even when life seems impossible. On the front of the metal, oval shaped locket were etched many tiny designs. Turning it over in his hand, Will looked at the inside on which was engraved his name, William Jonathan James. He ran his finger along the edge of the locket where once had been hinged another half. Will continued to stare at the necklace. It was the only link to his past yet it could never answer the questions he lived with. Who was he, really? Who had his parents been, what were their names, and why had they abandoned him to live the life of an orphan? Aside from the nagging and sometimes troubling memories and questions of his past, life for Will over the last year has been truly blessed. His relationship with Skye grows daily as he plans and prepares a future life for them. However, all he has envisioned is endangered by an unexpected stranger with a shocking identity. Suddenly, Will learns more about his past than he thought he'd ever know, but it comes at a steep price when he and everyone closest to him are thrown into the middle of a dangerous plot that threatens all their lives. Every Tear, the moving sequel to The Pirate Daughter's Promise, is an example of how God never leaves our side, even in our most troubling and sorrowful moments, taking every tear into account. Wealth and social standing mean nothing to Captain Kyle Bryden. To his family, however, they are everything. For years it has driven Kyle and his family apart. He longs for understanding from his parents, but most of all he yearns for them to accept the truth behind his faith. When his father sends him on a voyage to collect two family guests, it only complicates matters, particularly Kyle's growing desire to marry and make a home. He finds himself caught between pleasing his parents and living according to what he believes is right. As some things begin to change for the better, could a secret no one is expecting be enough to tear at Kyle's heart and destroy the love he has found? In A Captain's Heart, the continuing story of Pirates & Faith, meet new friends and revisit old ones while seeing the importance of patience and never giving up on those we love because all things are possible with God. “Marriage isn’t a bad thing,” Edward told his daughter gently. But as hard as Emma tries to stop it, she finds change is inevitable, particularly when her father’s business, and therefore her livelihood, is threatened. The last thing she wants thrown into the midst of it is romance. Determined never to marry or give up her passion for sailing, Emma’s quick temper lands her in more and more trouble, especially when it brings a kind and handsome rival captain into her life, throwing it into turmoil. In the dramatic conclusion to Pirates & Faith, can Emma find the faith to trust that God’s plans truly are better than her own, or will it be too late for a second chance? Excellent reviews Sarah! It makes me want to read them (though for my own good I'm not sure I should...seems there is quite a bit of romance in them for my tastes). :) What exciting plot lines though! :D Molly sounds like a very good writer indeed! I really like the cover art for "A Captain's Heart" and "Finding Faith". The art is very different, but equally striking. I really like the parchment and rope theme of "A Captain's Heart"!